Light barrier built with the Arduino, a laser module, and a laser detector module. In this tutorial, it shown how to build an optical barrier. The barrier detects any movement between the sender and the receiver. The sender is a laser module (Keyes KY-008) that emits red light (wavelength: 650nm). The laser detector/receiver is an unnamed module that returns either a LOW signal or a HIGH signal (no “analog values” in between). Schematic of a laser barrier. 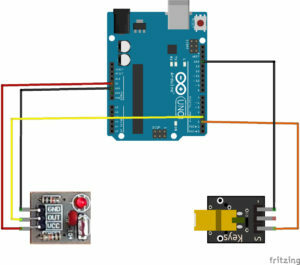 How to connect the laser module and laser detector to the Arduino? The laser module has three pins. 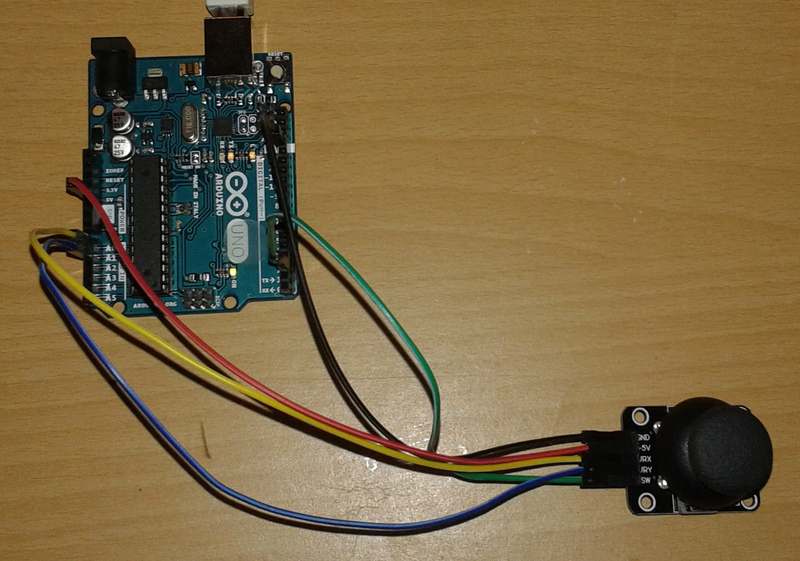 Only two pins are used: The “-” pin is connected to one of the Arduino’s GND pins. The “S” pin of the laser module is connected to the Arduino’s pin “2”. Therby, the laser can be switched off or on by sending either a LOW signal or a HIGH signal. The detector module has also three pins. The module’s “VCC” pin is connected to the Arduino’s “5V” pin and the GND of the module is connected to the Arduino’s GND. Lastly, the signal pin”OUT” of the module is connected to pin “3”. How to program the light/optical barrier? First, the pin values for the laser and the receiver are initialized. Next, the laser pin is set to OUTPUT mode and the receiver pin is set to INPUT mode. Then, the laser is switched on by setting “pinLaser” to HIGH. In order to monitor the light barrier’s state, a serial connection is started. In the loop function, the value of the receiver is read. The retrieved value can either be LOW or HIGH. LOW means that the laser does not reach the detector, e.g., something went through the light barrier and is located between the laser and the detector. Then, the value of the detector is written to the console. Finally, a delay of 1000ms is added for convenience purposes (serial monitor is not “flashing” the values). Serial monitor output of the light barrier example. If something is inside the light barrier, “0” is printed out to the monitor. Otherwise, if the red laser light points to the detecctor, “1” is printed out. The detector’s LED, which is located next to the detector, indicates whether the detector is connected to a power supply. This entry was posted in Development and tagged Arduino, Tutorial on January 20, 2017 by mschoeffler. 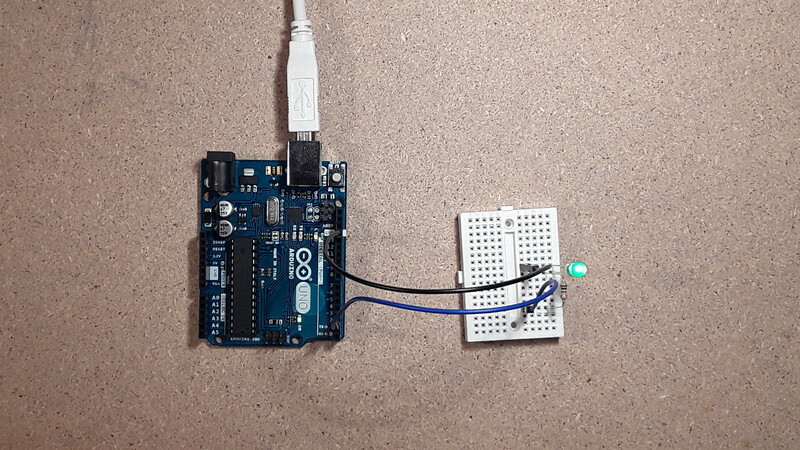 An Arduino (Uno) can be used to blink an LED. In this tutorial, an LED is controlled which changes its light status every 1000ms. 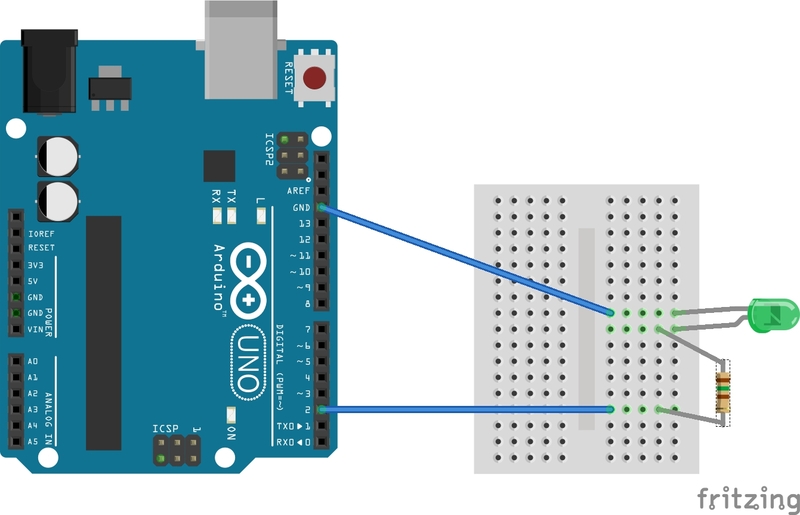 Picture of how to connect an Arduino Uno to an LED. LEDs have a forward voltage [V] and a forward current [mA]. Typically, the numbers of these two values can be found in the spec of the LED type. The LED used in this tutorial has a forward voltage of 2.2V and a forward current of 30mA. As the Arduino delivers 5V, 2.8V (5V-2.2V) have to be absorbed by a resistor. According to Ohm’s Law R=V/I, a resistor with 93.3 ohms (2.8V/0.03A) is needed. Since one typically does not have an resistor with exactly 93.3 ohms, the next “higher” one is used. Therefore, a 150 ohms resistor is used in this tutorial. If the forward voltage/current is not known, the use of a 1k ohms resistor is safe in most cases. 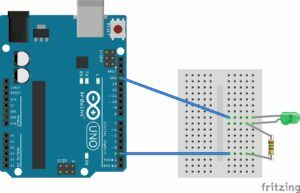 How to connect the LED to the Arduino? 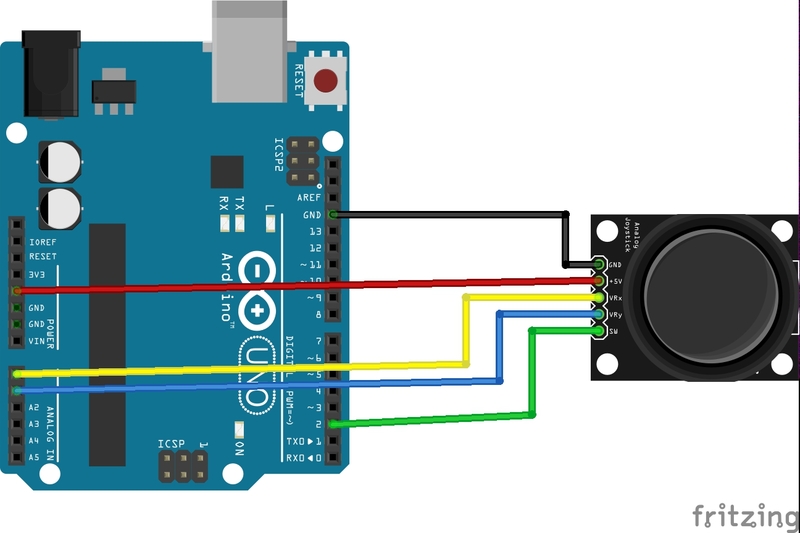 Scheme of how to connect an Arduino Uno to an LED. The Arduino’s GND pin is connected to the LED’s cathode (usually the short leg). One of the resistor’s pins is connected to the LED’s anode (long leg). The other pin of the resistor is connected to the Arduino’s pin “2”. As current flows only in one direction through the LED, the LED can not be connected the other way around. Resistors can be connected the other way around. Moreover, it does not matter whether the resistor is wired between GND and LED’s cathode or between pin “2” and LED’s anode. 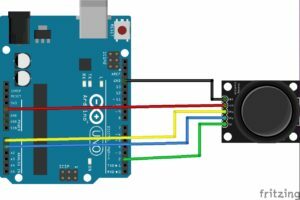 How to program a blinking LED? First, a variable is defined which stores the information that the LED is controlled with pin “2” (outLED). In addition, another variable is needed, which represents the LED’s state. As the state will be toggled (on, off, on, off,…), the variable is named “toggle”. In the setup function, pin “2” is set to output mode. In the loop function, toggle is inverted by use of the “!”-operator. The “!” is very helpful to describe a blinking state in one line of code. Next, the state stored in “toggle” is written to pin “2”. Finally, a delay of 1000ms is added in order to be able to perceive the blinking effect. toggle = !toggle; // change the state of the LED. If the state represents LOW, then change state to a HIGH value (done by "!" operator) and the outher way around. This entry was posted in Development and tagged Arduino, Tutorial on January 18, 2017 by mschoeffler. The KY-023 (or KY-23) is an easy-to-use analog joysticks for the Arduino microcontroller. The joysticks features two dimensions (x and y axis) as well as a state that is set when the joystick is pressed. 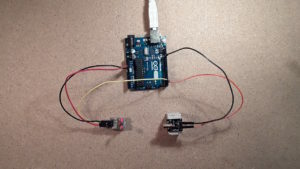 In this tutorial, it is shown how to connect the KY-023 joystick with the Arduino and how to use it. How to connect the KY-023 to the Arduino? Connecting the KY-023 to the Arduino is very straight forward. 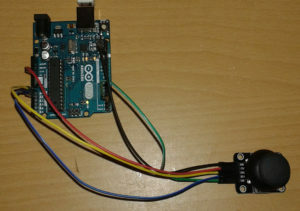 The module’s “GND” has to be connected to the Arduino’s “GND”. As the KY-023 work also 5 Volt, the module’s “+5V” has to be connected to one of the Arduino’s “5V” pins. 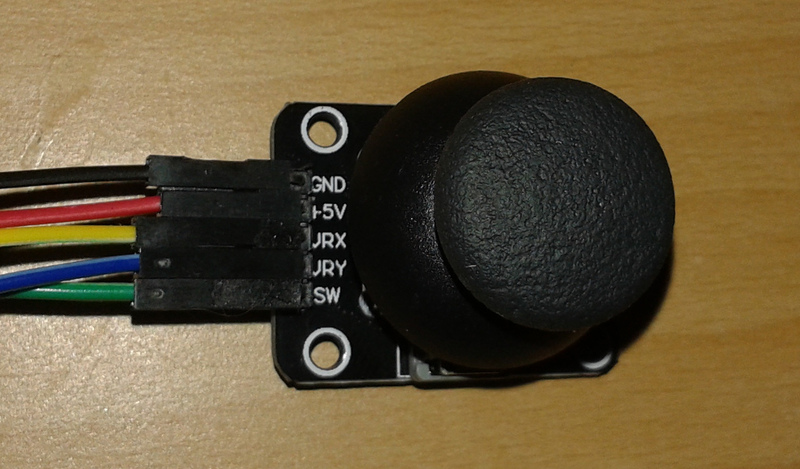 The joystick is basically a combination of two potentiometers. This means, when the joystick is moved along the x-axis the resistance changes resulting also in a change of voltage. The voltage can be used to detect the x-position of the joystick by connecting the VRX Pin to an analog input of the Arduino. The same applies for the y-axis. The y-axis’ position can be read by connecting VRY to an analog input. In this tutorial, VRX is connected to “A0” and VRY is connected to “A1”. Lastly, SW is connected to the Arduino’s digital pin “2”. 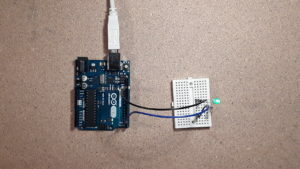 Picture of how to connect KY-023 to Arduino Uno. 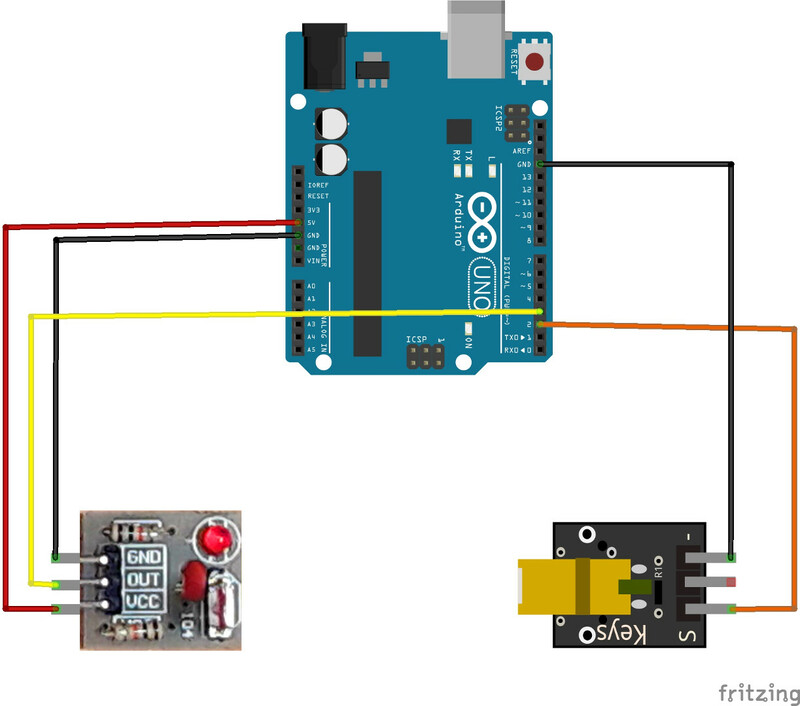 Scheme of how to connect KY-023 to Arduino Uno. How to program the KY-023 with the Arduino IDE? The source code is fairly simple. First, we will setup the two analog pins A0 and A1 and the digital pin “2” to detect whether the joystick is pressed. Next, we setup the serial connection which is utilize to print out the current state of the analog joystick on the console. Then, we read the analog data of the x- and y-axis. Thereby, the analog voltage of the potentiometers is mapped to a digital value between 0 and 1023. If the button is set up as shown in the upper picture/scheme, then moving the joystick to the left will result in an x value of 0. If the button is moved to the right, the x value will be 1023. If the joystick is moved to the top/north, then the y value will be 0. If the joystick is moved down, the y value will be 1023. The pin mode of the button (for detecting whether the joystick is pressed) uses a pull-up resistor. The result is that the value of the pin will be 0 if the button is pressed. Therefore, the variable name “notPressed” is used in the source code. This entry was posted in Development and tagged Arduino, Tutorial on January 6, 2017 by mschoeffler. It has been a little more than a year that my former colleagues and I published a paper in Springer’s Virtual Reality journal. Unfortunately, the paper is not accessible for free. 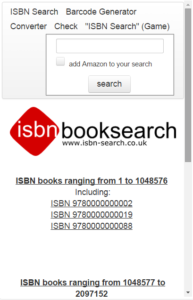 Fortunately, Springer allows to publish the submitted manuscript after a 12-month embargo (“self-archiving policy”). Therefore, I decided to publish the paper also on my private website. The paper is about an experiment in which virtual reality environments are compared to “real-world” environments. For the graphics in the VR environment, we used OGRE as graphics engine and the Oculus Rift (Development Kit – second revision) as output device. A lot of effort was put in the auditory part of the virtual reality environments. Abstract: In recent years, new developments have led to an increasing number of virtual reality (VR)-based experiments, but little is known about their validity compared to real-world experiments. To this end, an experiment was carried out which compares responses given in a real-world environment to responses given in a VR environment. In the experiment, thirty participants rated the overall listening experience of music excerpts while sitting in a cinema and a listening booth being in a real-world environment and in a VR environment. In addition, the VR system that was used to carry out the sessions in the VR environment is presented in detail. Results indicate that there are only minor statistically significant differences between the two environments when the overall listening experience is rated. Furthermore, in the real-world environment, the ratings given in the listening booth were slightly higher than in the cinema. This entry was posted in Development on January 5, 2017 by mschoeffler. Let’s assume we have selected a record (record_id = 7) and we want to select its previous and next record. 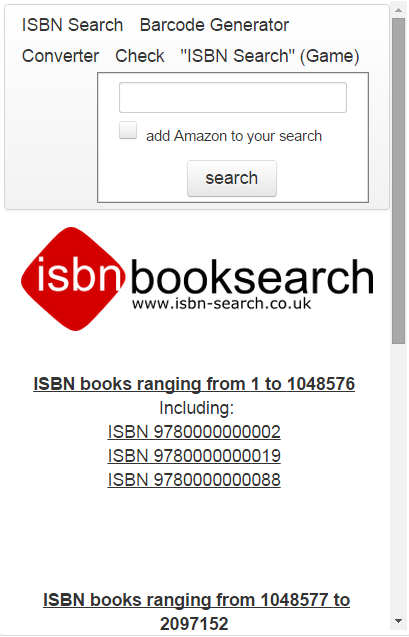 However, this does not work in many scenarios, e.g., if record_id is not a number or if numbers are “missing” (…,4,5,7,8,…). Therefore, a more sophisticated query is needed. This entry was posted in Development on January 1, 2015 by mschoeffler. The OculusWorldDemo is little demo application which is shipped with the Oculus Rift SDK and demonstrates some features of the Rift. Recently, I (and some more people) came across a nasty exception while trying out the OculusWorldDemo in OpenGL mode. 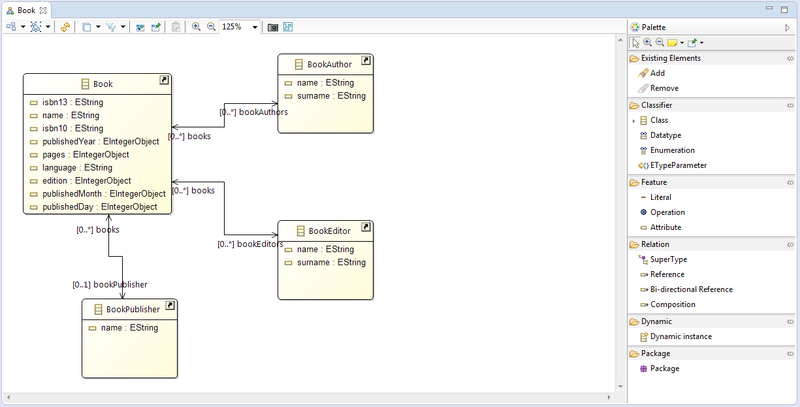 The function returns NULL and a few lines later an assert checks for the version and throws an exception. For retrieving a valid OpenGL version, one must create a valid OpenGL context before calling the glGetString function. In OculusWorldDemo this happens in Render_GL_Win32_Device.cpp at line 145 (HGLRC context = wglCreateContextAttribsARB(dc, 0, attribs);). On my system (Windows 7, GeForce GTX 560 Ti), wglCreateContextAttribsARB fails to create a context and returns a NULL pointer. There are more than one reason for getting a NULL pointer here. Long story short, you can replace the function call by calling wglCreateContext instead. The function has only one argument (the handle to the device context) which is why we do not have to add some additional code. This entry was posted in Development on November 26, 2014 by mschoeffler.